Most people searching for a PDF editor want software that is functional, full of features, and works efficiently. Icecream PDF Editor manages to check all those boxes and adds plenty more to the party to make a well-rounded PDF tool. Moreover, this is a completely free PDF editor. Like other programs by Icecream Apps, the PDF Editor benefits greatly from being easy to use; whether that’s the rapid installation process or general navigation, the app is a joy to use. This program is a completely free PDF editor, and all the features are available in full. 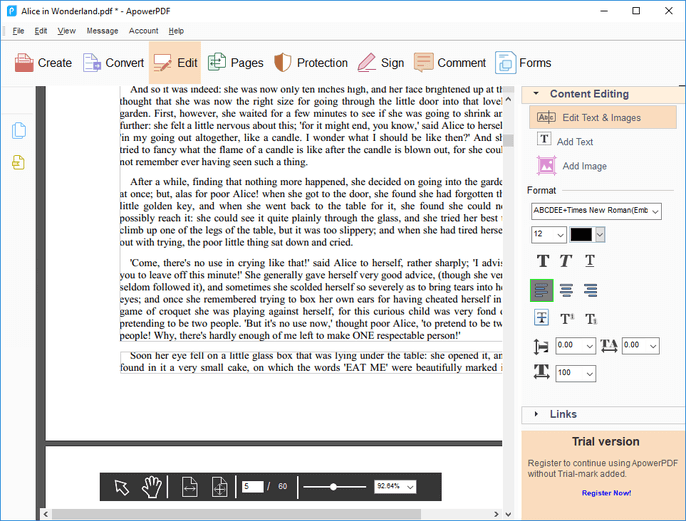 Slick and modern, Icecream PDF Editor has all the editing tools you need, such as the ability to edit PDF text, add notes, redact text, secure files, and manage pages. Access to all features is easy, making this editor ideal for beginners and experts alike. Users will appreciate the smart tools panel, which provides important features based on your current task. Like any other decent PDF editor, Icecream PDF Editor allows users to create a PDF from scratch. Other interesting features worthy of mention are the ability to draw directly onto a PDF and add watermarks to further protect your work. ApowerPDF is a powerful free PDF editor that is available in two versions, both of which are presented on the app’s website. The first option is to “Launch Online” and use the browser version of the app, while the second is “Download Desktop,” which gets you the full suite. While aesthetically similar, these two versions have interesting differences. It is worth noting that the desktop version is merely a free trial to the paid version of ApowerPDF. During the trial, any PDFs you create will be watermarked by the application. 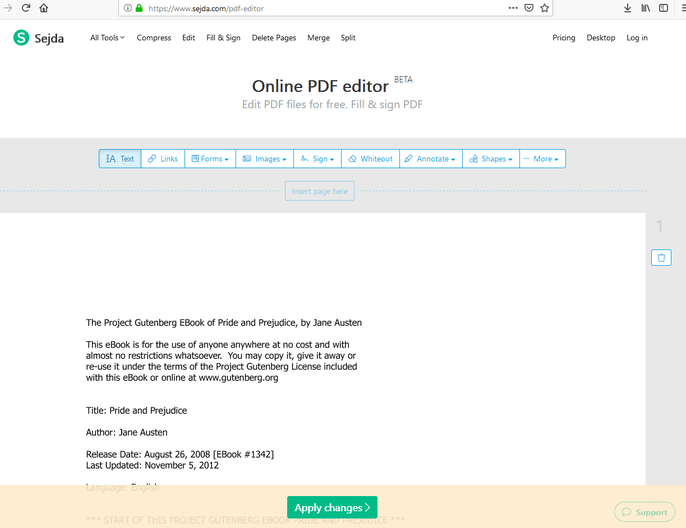 As you may expect, there are more features on the desktop version of this PDF editor as it is behind a paywall, but the online version we tested is certainly no slouch. By choosing “Launch Online,” you will need to download a small launcher app to start the online PDF editor. Among the features available for free in your browser are text editing with formatting, text and image editing, the ability to encrypt documents with password authentication, and the ability to convert PDF files to images. PDF-XChange can mostly stand toe to toe with the best PDF Editor programs available, but it especially stands out in one important area. When testing this app, we found it is an excellent choice if you edit a lot of text within PDF files. 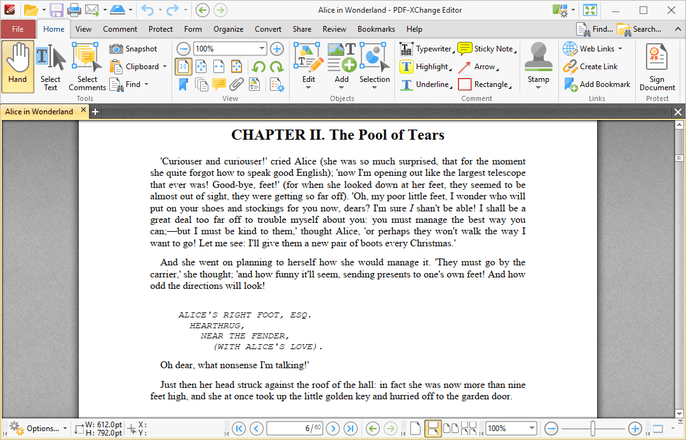 PDF-XChange puts text editing at the core of the experience, including the ability to retype, delete, and reformat text. Furthermore, this PDF editor automatically matches fonts from your original opened PDF files. While text editing is certainly a good reason to choose PDF-XChange as a PDF editor, it also boasts other important editing tools. For example, you can split PDF files, extract pages, and attach comments. Another excellent addition to this software to edit PDF is the ability to use OCR to pick up text in scanned documents, which is vital for users who have printed or scanned documents. Perhaps we could have scored PDF-XChange higher, but our experience was hampered by the paywall-restricted UI. 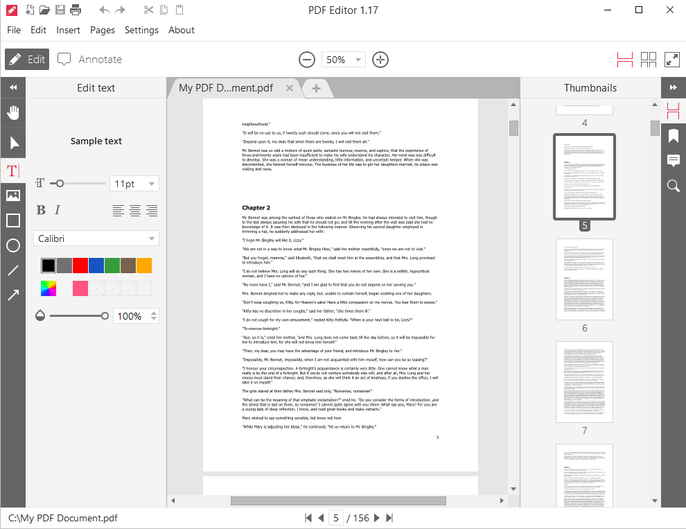 The trial version of the PDF editor displays all features available in the full application. However, some of these features are blocked behind a paywall. Is Sejda the most powerful PDF editor? No, is the simple answer. Yet it deserves a place on our list because it is a super-light PDF editor that functions for free online. This makes it ideal for users who want to edit PDF files on the fly, maybe on a mobile device, and with plenty of editing tools thrown in. While we doubt pro users will get much mileage from Sejda, users looking to complete quick editing tasks will be happy. As a free online PDF editor, Sejda is surprisingly well featured. Among the editing tasks users can perform is the ability to add/remove images, links, text, and shapes. Elsewhere, features like annotations and document signing are also available. We love the “whiteout” feature that allows users to create a white space on their PDF without losing content. Using the web app is easy. Simply upload the relevant PDF files and click “Apply Changes” when you are finished to download the edited file to your PC. One major caveat is Sejda automatically times out after three hours. Sure, that’s a generous time, but if you have a lengthy PDF to edit you will have to consider this as the app automatically deletes content when the three hours pass. The second part of the PDFsam name stands for “split and merge,” which tells you where the specialty of this PDF editor lies. We tested the premium version, which gives access to all pro-level tools. Eventually the trial ends, and if you don’t pay you are left with a stripped-down solution, one which is admittedly still a good option to edit PDF files. Yes, the free version lacks some tools such as OCR support, security authentication, and object insertion, but it is a well-designed PDF editor that allows even large PDF documents to be edited efficiently. PDFsam really stands out as a page management tool for files, allowing page extractions and the ability to rotate pages. Unlike some other options, PDFsam also makes it very clear which features are available in the stripped-down version and which are behind a paywall. Finding a good PDF editor is easier said than done. Many options that look good on paper end up with frustrating quirks, such as leaving watermarks on the file. The list of solutions you see above represent the best free PDF editors, including those with pro-level features and slick modern interfaces. You may be interested in a tutorial on how to convert PDF to Word online for easier content editing. 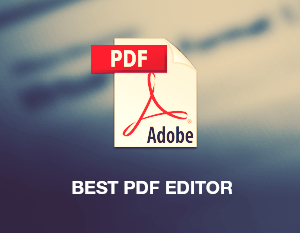 Tags: ApowerPDF, best free PDF editor, best pdf editor, edit pdf, free pdf editor, How to edit a PDF, How to edit PDF, Icecream PDF Editor, Online PDF editor, pdf editor, PDF editor free, PDF-Xchange Editor, PDFsamBasic, Sejda.